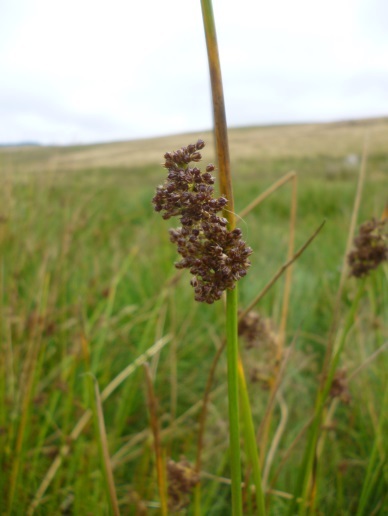 Finally handing out three rush species and the FSC Guide to Rushes, follow the keys to identify them. Of the 30+ species found in the UK, only 15 occur in Kirkcudbrightshire (VC73) – a list of these was provided, but it doesn’t rule out any that may be found in the future – just keep a look-out for anything unusual. 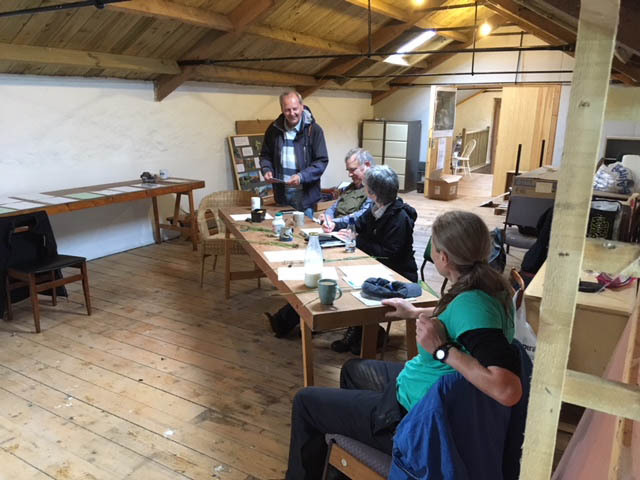 I told the group which of the FSC keys were irrelevant to our circumstances – mostly alpine or Cornish species! 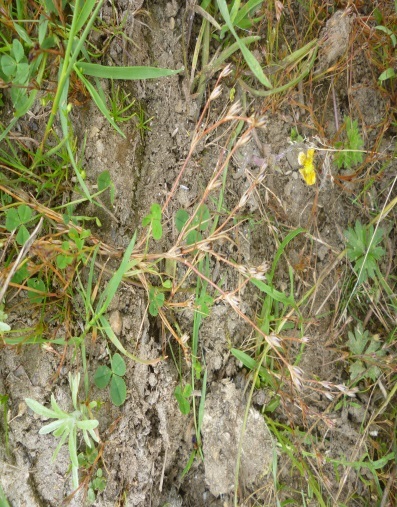 Guidance where necessary helped successfully ID the species – Juncus effusus, J. articulatus and J. bufonius. Not necessarily in that order – up to you to label each of my photos! After which, lunch. The early part of the afternoon was spent outside under somewhat wet conditions, looking for rushes along the shore, saltmarsh and nearby fields. Instead of using the FSC keys, the aim was to use easily recognisable characteristics of each species to pick them out and ID them. First off were the sharp-flowered and jointed rushes, distinguishable by the number of transverse septa in the leaves: 1-2 per 10 cm for J. acutiflorus and >5 for J. articulatus; plus brown capsules for the former and black shiny capsules for the latter. Then Soft Rush which caused a few problem when specimens with fully expanded cymes, partially expanded ones and very compact ones were found. But the smooth stem and solid pith soon sorted that. 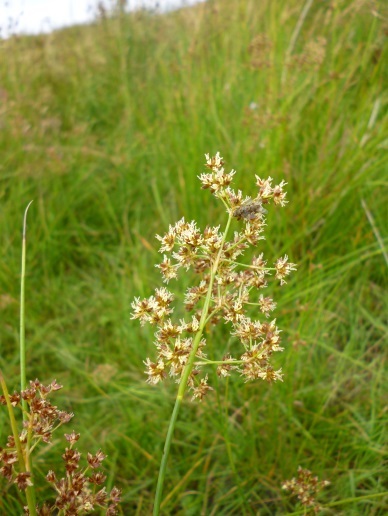 At the top of the saltmarsh we found Sea Rush, with a greenish, fairly compact head overtopped by a long stem; and Saltmarsh Rush, a much smaller species with fine leaves and a few-flowered spike again overtopped by a longish bract. Surprisingly only one stunted plant of Toad Rush J. bufonius in almost bare ground beside the burn running into the bay, while inland in a field which occasionally floods on very high tides, the grey-green (a characteristic useful even from a distance) shoots of Hard Rush – unfortunately heavily chewed, so that we found only a couple of fruiting shoots a bit like a very delicate Sea Rush, but with a very stiff, pointed stem tip. Although the day was supposed to be about rushes, the varied flora during the walk initiated discussions over ID characteristics for a number of species, including Common Sea-lavender Limonium vulgare, Restharrow Ononis sp. which turned out to have characteristics of both the common species O. repens (stems hairy all round) and the uncommon one O. spinosa (spiny stem) and some features which fitted neither (seed capsule to calyx size and the flower’s wing to keel length). I’m sending this off to the referee for a decision! Hedge Parsley Torilis japonica in flower now, later than its commoner relative Cow Parsley Anthriscus sylvestris; various knotgrasses Polygonum spp. over which I am still puzzling; etc. And back to the farm’s barn for the summing up, etc. and departing after thanking Lee for allowing us to use the barn and facilities for the day. Hope you enjoyed it and found it of benefit.